You understand the need for a solid enterprise resource planning, or ERP, system. Without it, managing your business could be more challenging than it needs to be. ERP systems help connect various departments and activities, provide valuable business tracking and insight and help carry out the transactions that separate your business from the competition. But implementing a new system can be a mystery at best, and a challenge at worst. Before diving into how to make your new ERP system implementation a success, it’s best to understand the process. If you’re confused about finding the right ERP system, and understanding what a change might involve, you’re not alone. According to Gartner, 48 percent of ERP decision-makers are confused about the options available, various solutions and the implementation process itself. Research — Before moving forward with an implementation, you’ll need to research options to ensure you select the best system for your business’ needs. During this process, you’ll want to take a look at what solutions you need your new system to provide, to find options that fit your budget and to interview various ERP providers. We’ll cover this in more detail below. Discovery — Once you select the solution that’s right for your business, it’s time to begin the discovery process. During this time, your chosen ERP system provider will examine existing business processes, share the vision and scope of the project, set a timeline and work with you to ensure each need you’re facing will be covered with the new solution. At this point, all parties will share and agree upon final investment information. Analysis — After the project’s broad framework is in place, a second, deeper level of discovery takes place. During this time, you’ll analyze specific information relating to system requirements, data and needs. Strategy development — Once you have collected relevant data, your chosen partner will work with your team to develop a specific strategy that includes benchmarks, team members involved, training and other important details that will make your new system a success. Building — Building looks different for each project, depending on whether you select a modular solution or a custom ERP system, which we will discuss in more detail going forward. However, your partner will start to build the final solution your organization will need to accomplish the goals you have in place for your new ERP system. Customization — All ERP systems require a certain level of customization, though some require much less than others. Modular solutions are industry-specific, generally requiring less customization than projects that are built from the ground up. The level of customization required can change the timeline and final investment of your new system. Data conversion — After your new ERP system’s framework is in place, the data conversion process will begin. During this step, the data used by your existing ERP system or stored in a digital format elsewhere will be converted — through uploads or manual entry — into your new solution. This process looks different for each ERP solution. Training — No ERP system should go live without adequate training. Training will give your team the time and information necessary to become comfortable on your new ERP system before going live. This is the time to ask questions, to identify potential problem areas and to encourage those who will be working with the new system. Testing and stabilization — Testing and stabilizing your new ERP system helps eliminate potential bugs while working toward a smooth transition and deployment. Deployment — After your team feels comfortable, data has been converted and each part of the process has been completed, you’ll be able to deploy your new system. This works best during less-busy times of the year, to minimize any frustrations that may crop up. Going live can be exciting, as it allows you to see your final solution in action and to realize its benefits. 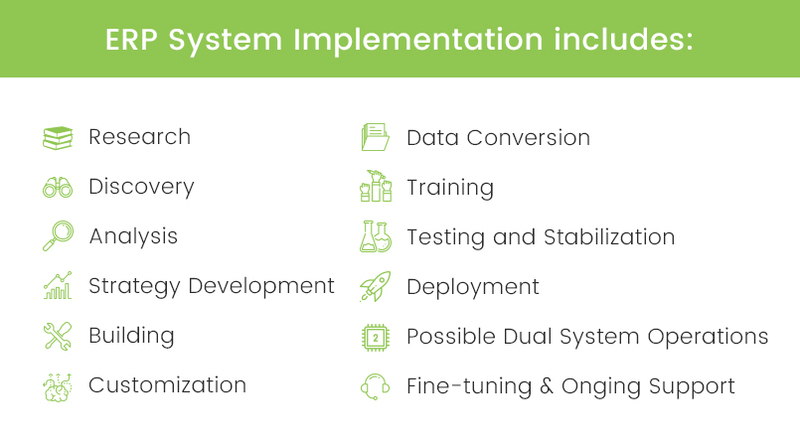 Possible dual-system operations — As you move to a new system, you may operate in conjunction with your existing system in the beginning, to ensure you’re not losing critical functionality before abandoning the old system altogether. Fine-tuning and ongoing support — During deployment and beyond, your system may require fine-tuning or modifications. This step may be completed by members of your in-house IT staff, or by the support team provided by your ERP system provider. The steps above provide a general overview to the ERP implementation process. There may be additional steps, or areas to avoid depending on your system selection and needs, but it’s a start. To make the most of your implementation, consider the ideas we’ll present in the rest of this piece. If you’re ready to make a change, now’s a great time to act. According to Forbes.com, cloud-based solutions and ERP systems have grown more than quadruple the rate of traditional IT spending since 2009. Experts predict that trend to increase to six times more by 2025. To keep up with the competition, getting the right system in place is critically important. Fully integrated business processes that are concurrent between various departments. A centralized database without duplicated data points and fewer areas requiring manual data entry and sorting. This is an upgrade from traditional, Excel-based databases. Increased insights and real-time availability of information to inform better decision-making. But before you can demonstrate these changes and implement the process, it’s critical to select the ERP system that will meet the current and future needs of your business. To accomplish this, start by gathering key players in your organization that work with — or will work with — your ERP solutions. Gather input relating to existing frustrations and bottlenecks, along with what they’d like to see in a new system. Make note of the input you receive before proceeding. Build a list of potential vendors, take part in demos and look for solutions that specialize in your industry. Schedule appointments to ask questions and to review possibilities, and check references when possible. The more information you have in your pocket, the better prepared you’ll be to make the right decision. Modular or Custom Systems: What’s the Difference? While researching various ERP systems and solutions, you may come across two options: modular ERP solutions and customer ERP solutions. From a use perspective, these two options may feel similar. They provide similar long-term benefits and offer the same level of flexibility — in-house or hosted solutions, functionality that meets specific needs and solves innate business problems and more — but the implementation process is where you’ll see the most notable changes. Many businesses believe custom ERP solutions are their only option. Because of the complicated processes they have in place, they believe the only system that could possibly meet their needs must be built from the ground up. In a few, unique situations, this may be true. But, for the most part, custom solutions require significant investments to get the framework in place, extended periods of time spent on training and higher levels of fine-tuning after deployment. According to Toolbox.com, over-customization increases both the risk and cost of ERP system implementations. Training can be more of a challenge when a system is over-customized, and updating the system in the future can prove to be nearly impossible, leading to the need to replace the system sooner than necessary. Modular solutions are the alternative to over-customized ERP systems and solutions. These ERP systems function as “mini” systems that can be grouped to meet specific needs. If a company needs an ERP accounting system, but not an inventory management solution, they can pick the features that are most appropriate for their needs. On the other hand, if a company needs a complete system that communicates with other “modules,” this is also possible. Faster implementation times, which lead to faster deployments. Testing and improvement based on other users and customers, eliminating excessive testing during implementation. Lower levels of risk. If the solution is working for others in the industry, it’s more likely to work for you. Lower upgrade costs, as these solutions can be hosted in, supported by and modified in the cloud. While this is also possible with custom solutions, it can be more expensive. Lower overall costs. Because modular solutions are more streamlined and require less “building,” the cost of a new system can be less than a fully customized system. It’s important to note that modular solutions can still be customized. No solution is truly one-size-fits-all. If all ERP solutions were the same, this article would be unnecessary. Because your business has specific needs, a brand presence to maintain and departments that may be unique to those of your competitors, your system should reflect that. The customization, however, can be accomplished simply, without starting from scratch. When looking for a solution, instead of assuming you’ll need a completely customized system, talk to modular providers and share your needs. You may find the final result — and implementation process — will be more along the lines of what you’re looking for. While your chosen ERP solution may meet your needs and have a process in place for implementation, it’s in your best interest to select an in-house ERP implementation team and project manager to support the changes that will be taking place. The basic premise is this: Your team will have questions, concerns and possible hesitations about your new ERP system. They may be comfortable with current solutions, and might not understand the need for something new. They may be anxious about learning new processes, and they may have several questions during the training and implementation process. While your ERP provider will be able to manage the training and technical aspects of the transition and implementation, they will not be able to communicate with every member of your in-house staff. When numerous team members have questions, taking them to your provider could cause extensive hold-ups, increasing the time spent on the implementation by pulling the team away from critical implementation functions. To minimize this struggle, look at your team members. Who is skilled in both communication and project management? Appointing this person as the liaison during the implementation process will give your entire team someone to go to with questions. This team member can then pass on questions to your ERP solutions provider during the process and come back with answers. Under this person, appoint a few members of your team who are fast learners and enthusiastic participants to help motivate those who may be more hesitant to move forward. This will help raise morale during the implementation process, which could lead to more positive results. Remember, throughout the implementation process, a significant amount of data, information and knowledge will be transferred between your ERP solutions provider and your staff. Alleviating areas of struggle will help facilitate the process in the best way possible. Successful implementations require commitment from all sides, and having the right team in place from the start could help you accomplish this goal. ERP implementations vary from one solution to another. The average implementation timeline for ERP systems ranges from three to 24 months. This wide range makes it difficult to anticipate what to expect before talking with your implementation team. Like any implementation or project, you may want to build some cushion into the launch time in case you exceed your initial timelines. Unrealistic expectations — When an organization doesn’t understand the timeline, the project could go longer than expected. Unaccounted-for data and information — If the discovery process mentioned in the introduction doesn’t reveal the full extent of a project, it could take longer than expected. Miscommunication — If communication between a provider and an organization is unclear, delays are a natural result. Over-customization — When systems must be built from the ground up, instead of working within a modular framework, the timeline could face delays. The most important thing to recognize is that implementations — just like ERP systems themselves — come in various shapes and sizes. This means clear communication between your solutions provider and team is paramount for setting accurate timeline goals and benchmarks. Take the time to ask questions from the start, share as much information as you can and be available when necessary for an on-target deployment. For your implementation to be successful, your team members will need to develop a level of comfort with the new system. This means training is absolutely paramount. Committing to overtraining — It’s better that your team members feel as though the information they’ve been presented with is redundant than worrying they are unprepared for deployment. Making training widely available — Consider bringing “off-shift” employees in and paying for training, or providing other incentives for attending training sessions. Encouraging questions and participation — If your team members feel empowered to ask questions and to participate fully in practice sessions, the training will likely be more effective. Providing overall encouragement — Remember, the system is new for your team. Employees may feel attached to previous systems or methods, and change can be worrisome. Recognize those going above and beyond, and provide positive feedback throughout the training process. An ERP system can only be effective if team members are equipped to operate it properly from the start. Training is one way to ensure this outcome. ERP implementations can be smooth, especially when working with modular platforms designed with specific industries in mind. But every implementation will face an unexpected roadblock or two. To avoid common downfalls, a good practice is to become familiar with any speed bumps you might encounter. If we break up these topics into a few main categories, we can see poor training, poor communication and inadequate support are among the top few. If you commit to encouraging employees and providing adequate training, communicating clearly with your provider from the very beginning and providing in-house or out-of-house support to your team and system, you can avoid these potential problem areas. Remember, clarity, communication and participation are critical for success. To fully realize the benefits of your ERP system, and to measure the success of your ERP systems overall, it is necessary to set benchmarks for during the implementation and beyond. Your ERP system provider should be able to work with you to set specific target goals and dates. However, you should also have an idea of what matters most to you. Why did you look for a new solution in the first place? Whether you’re looking for a specific solution, to replace existing software that may be dated, increasing accounting capabilities or something else, your goals will help inform your target end performance and benchmarks along the way. At the conclusion of the process, after your system has deployed and is part of daily operations, take the time to evaluate every month or so, then less frequently as time goes on. Is there a persistent area of trouble or frustration? Do you still have questions about specific features? The success of your ERP system may depend upon your understanding of the system’s functionality, along with the way you integrate it into daily processes. Keeping an open line of communication between your ERP system provider, administrator and team will help your system work to its fullest potential, bringing significant benefits to your business in the long term. Setting benchmarks and measurements of success will aid in this endeavor. As you move forward in the ERP software implementation process, remaining informed will help you make the best decisions for your business. Remember, working with consultants who understand your business and needs will lead to the best results. Our team has been providing end-to-end software solutions and ERP implementations since 1978. That experience reduces the risks associated with the implementation, increases the speed of the process and ensures you’ll see the results you’re looking for in your new system. To learn more about implementing a new ERP system with FDM4, visit our website today. We look forward to working with you to make your new ERP solution a success.